The past few years have been sobering for anyone concerned with our planet’s future. 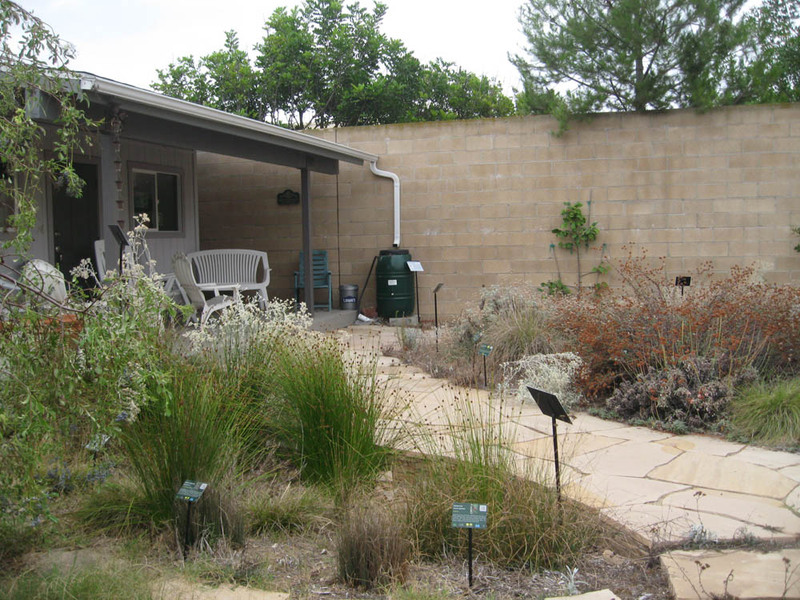 In Southern California, the effects of four years drought can be seen in nearly every garden and wild place. Record-breaking heat and winds have also plagued us, compounding the effects of the drought. Climate change is happening right now – and we’d best be planning for more to come. 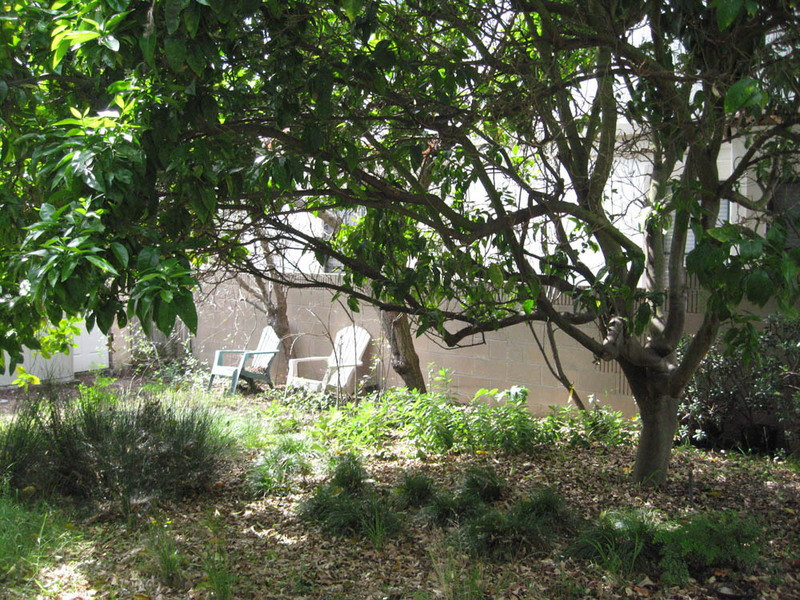 In 2014, we gave a talk on Climate Change and the Southern California Garden. We discussed the climate models, their predictions for Southern California and the implications for local gardens. Two conclusions are clear: 1) overall temperatures – and the number of high heat days (> 95° F; 35° C) – will increase in S. California over the next century; 2) the frequency of extreme precipitation years (both drought and greater than normal precipitation) are also likely to increase. For more predictions see our 2014 talk: http://www.slideshare.net/cvadheim/climate-change-2014. The climate predictions have clear implications for garden design and planning. In fact, we’re surprised the media isn’t teeming with articles on the subject. The good news? We can take steps to mitigate effects of climate change in our homes and gardens. The sobering news? We need to take action now rather than putting it off until next year or the next decade. This winter will likely bring needed rains to our part of the country; and as we discussed last month (http://mother-natures-backyard.blogspot.com/2015/08/preparing-for-el-nino-winter-rains.html), wet years are the perfect time to plant. The question is, which plants to choose? The current drought has spawned much interest in drought-tolerant plants. While drought tolerance is important, it’s not the only characteristic needed to survive the next century. Our S. California garden plants must adapt to higher temperatures, more extreme heat days and greater precipitation extremes – and that’s just a start. While only the future will tell, we suspect that some drought-tolerant plants in local gardens will not make it through the El Niño years or periods of prolonged high temperatures. So what plants are likely to be long-term survivors? The past decade has provided an interesting natural experiment in gardens and wild lands alike. Those who manage natural areas have a front row seat to the action; our wild lands clearly demonstrate which local plants can survive drought on rain alone - and which cannot. And if we have a strong El Niño winter this year, we’ll see which plants can take not only the drought, but also the subsequent floods. At the Gardena Willows Wetland Preserve and gardens – and the Preserves and gardens at California State University at Dominguez Hills – we hope and pray for an El Niño winter. Clay soils are the proving grounds for a plant’s ability to tolerate winter flooding. Since both sites have clay, they will provide a good test of El Niño survivability for a variety of California native plants. We look forward to the results –positive and negative. Those plants that survive both the drought and the floods will likely be long-term winners as our climate changes. And that’s particularly important when choosing long-lived plants like trees and large shrubs. Our gardens must provide more shade in the future. Hardscape features like patios, arbors and awnings are one way to create shade. But ‘living shade’ – that provided by trees, shrubs and strategically placed vines – has additional benefits. Plants cool the surrounding areas by evaporative cooling; that’s why the shade under trees feels cooler than the shade under a patio roof. Plants also release oxygen, clean the air of contaminants and provide habitat for numerous creatures. If chosen carefully, shade trees and shrubs provide colorful flowers, edible fruits and a green oasis in summer. Ideally, shade-producing plants are long-lived – 50 or more years is ideal. That means that shade trees planted now must be tough enough to thrive in the climate of 50 years and more in the future. We’re betting strongly on California natives, including some trees and shrubs that already grow in the Los Angeles Basin. Locally native survivors are appropriate for our soils and provide key habitat for local creatures. So we should use the local natives when appropriate. But our shade trees/shrubs may also need to come from further afield. Plants that thrive in other mediterranean climates, including citrus trees like Blood oranges, lemons and tangerines, are one good option. They provide tasty fruit and require only occasional deep summer water. But we should also consider trees and shrubs from California regions that currently experience heat, drought and occasional floods. The California deserts, particularly the Mojave and Sonoran Deserts, fit that description. 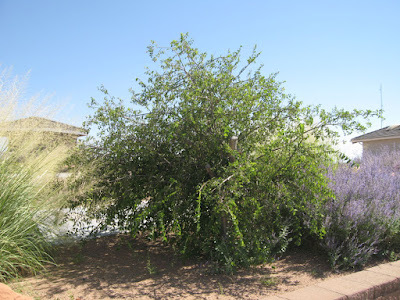 While some desert plants are small, a surprising number of large shrubs and trees grow in the desert foothills and along desert arroyos and seasonal streams. Many of these plants are already used in home gardens throughout the Southwestern U.S. Perhaps we should also consider some for local use? 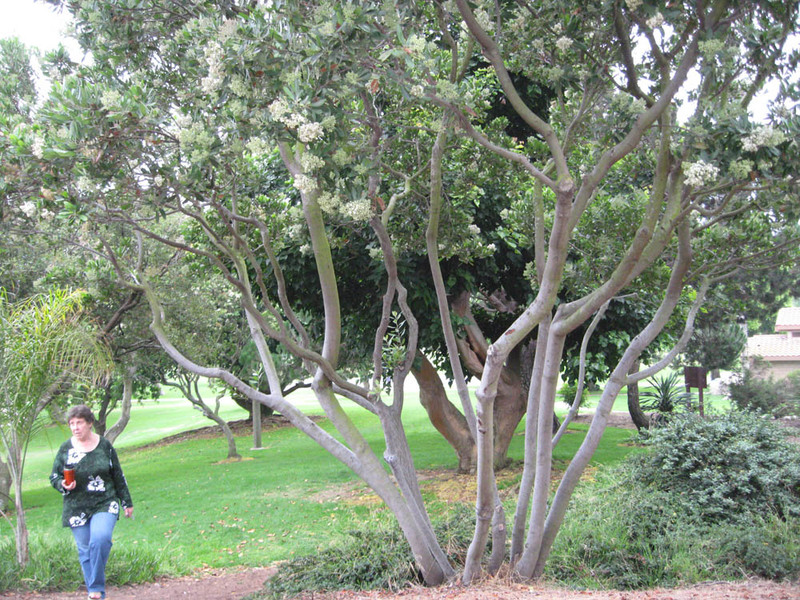 There are several potential drawbacks to using California desert trees/shrubs in the Los Angeles Basin. One is our lack of experience with them, particularly in gardens whose drainage is less than perfect. Desert soils, including those from desert waterways, tend to be sandy, rocky and well-drained. Not all soils in western Los Angeles County are blessed with excellent drainage. But is perfect drainage an absolute requirement, particularly if we limit summer irrigation? We suspect that some desert shrubs will survive just fine in the soils of the Los Angeles Basin. For example, we’ve seen desert Paloverde trees thriving in local neighborhoods with clay-loam soils. But we need more experience with desert plants in local gardens. Fortunately, native plant nurseries like the Theodore Payne Foundation, Grow Native Nursery (Rancho Santa Ana Botanic Garden) and Tree of Life Nursery are now offering some of these plants for us to try. We need to begin these trials now – the information may be essential to future gardens. Another potentially serious drawback is the introduction of new (non-local) species into wild areas. This is a serious issue; it’s the reason why many native plant groups, including the California Native Plant Society, advocate growing plants from locally native seed sources. Those who live near wild areas should be good neighbors in their plant choices. But the issue of plant introductions is particularly knotty when considered from the perspective of future climate change. Plant distributions are already shifting due to changes in temperature and precipitation. Some plants are ‘moving up the mountains’ as the valleys get hotter; other natives are struggling with the drought. Dramatic climate changes require a serious re-thinking of our concepts of locally native species. How does one define the ‘local native plant community’ when conditions no longer support its continued survival? Should we try to sustain local communities with supplemental water? These are questions that challenge the most capable scientists and Preserve managers. 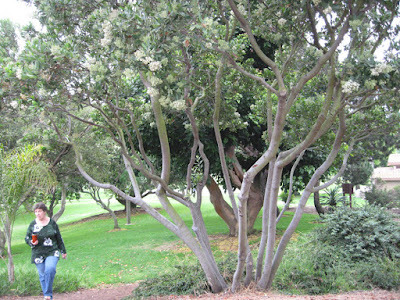 Toyon (Heteromeles arbutifolia) pruned as multi-trunk tree. So what is a responsible gardener to do? Plant local natives as a first choice, particularly if you live within a mile of native vegetation. And choose species that have the least potential for becoming invasive. We’ve included several plants on the list below with some trepidation. These include the native mesquites, which have become invasive in parts of Africa and Australia. They are wonderful, drought- and heat-tolerant plants; and they don’t present a problem in areas with limited precipitation. But we’ll need to watch them closely if we plant them in the Los Angeles basin. The plants on the list below were chosen for their potential as shade trees or large shrubs. However, the shade provided varies from dense shade to light/dappled shade. In general, desert trees are more open; they provide filtered shade. But remember that desert plants tend to have denser foliage in gardens than in the wilds. Also note that some desert plants are armed with thorns; that can be an issue until the plants achieve tree-size. The list below is based on empiric observations (of local species and some desert species) in a range of soils from sandy to clay. 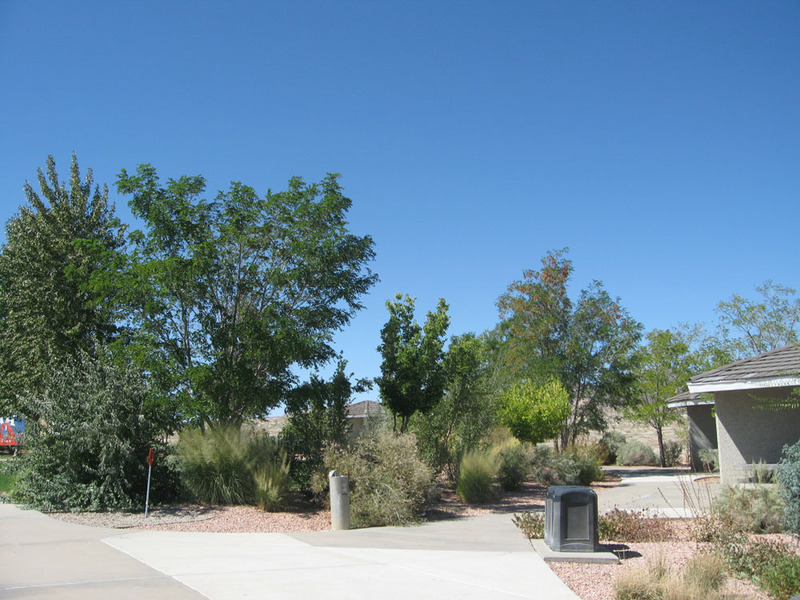 These plants appear to do well in a range of precipitation regimens; they also tolerate summer heat (the desert species being the most heat-tolerant). In choosing plants, we assumed they might receive occasional supplemental water in drought years. And some potential candidates were excluded due to large size and/or roots that invade water or sewer pipes. We view this list as a first attempt; we will continue to modify it as our experience with these and other native plants grows. Please feel free to send us your suggestions, recommendations and experiences in growing native trees/shrubs in our changing environment. We will add them to our collaborative list. This is a great list. The Tecate Cypress is one of my favorite plants of all time. And the Chilopsis is one that many homeowners love.